2. To help provide societal rewards and cultural reinforcements for education by changing, or at least augmenting, the categories of individuals to whom our culture affords celebrity status. In a history class, an instructor might well use a world map to point out the boundaries of Alexander the Great’s conquests. Similarly, with Chronologium Academicus an instructor could point out the “areas” of Romanticism in literature and music, the "area" of medieval political science, or of World War I. (See illustration below). With just such minimal instructional use, the chances of fostering the needed change in our perception of the relevance and meaning of education can be significantly improved. and, WORLD WAR I (1914-1918) (grey horizontal). 6. Education's perceived relevance and meaning can be enhanced. On providing societal rewards and cultural reinforcements for education. The perceived relevance and meaning of education in our society is generally considered too central, systemic, and cultural a problem to be amenable to solution. However, the widespread use, adoption, and display of Chronologium Academicus could represent a systemic first step toward such a solution, particularly through its capacity for making the portraits of the famous of history and academia more familiar to those exposed to it. 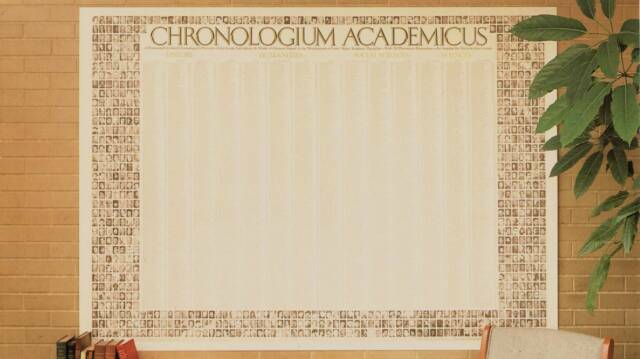 However, Chronologium Academicus alone will not be enough. In our society, the steps needed to produce societal rewards, images, symbols, and other cultural reinforcements for education can effectively be taken only by, or at least through, the media, especially television and films. Largely through the media, we need to augment the categories of individuals to whom our culture affords celebrity status. Other than the occasional made-for-TV movie/docudrama (covered below with the film industry), television news and entertainment divisions, including talk shows, presently afford such status only to political leaders, entertainers, and sports figures. Barring some ancillary reason for notice, such as economists during a protracted recession, academic figures receive little if any coverage, other than the usually cursory mention made upon such occasions as the announcements of the Nobel Prizes. Willis Lamb, the physicist who discovered the Lamb shift in the frequency of the hydrogen atom. *John Adams (2008) with Paul Giamatti as John Adams. * = Particularly noteworthy productions. However, the television industry can make some of the needed changes more readily, and more cheaply, than the film industry. Therefore, if television were to proceed first with some success, or at least without significant loss, the film industry could be encouraged to re-enter into the production of such biographical films again in earnest. 1. Television talk shows should have academic figures on as guests at least once or twice a month. 2. At a similar frequency, talk shows should also have classical music performances (such as a live movement from a chamber or solo piece, or a filmed orchestral work), and operatic performances of an aria or an ensemble piece preceded by a short setup explanation of the action. (For example, if Rigoletto were being performed in New York or Los Angeles, Letterman or Leno could have the four cast members that perform the Quartet on as guests to perform it live, or to show a filmed clip of it from a dress rehearsal). 3. Television news divisions need to increase their coverage of academic discoveries and developments, and of the commemoration of past academic milestones. 4. Existing and future scripted programming portraying such characters as doctors, lawyers, psychiatrists, and political figures should have those characters refer to founders of and contributors to their disciplines and professions more frequently and more pointedly. 5. All speakers, particularly those in news and documentaries, should be discouraged from using the historic present tense. 6. Composers should always be credited, even on commercials. In sum. The societal rewards and cultural reinforcements for education that the media can bring about–combined with the widespread adoption and display of Chronologium Academicus–can produce the necessary change in our cultural perception of education’s relevance and meaning beyond the economic. The author and publisher will do their best to encourage individuals within the media, educators, and political decision-makers to take the needed steps.